STORRS, Conn. – Cierra Dillard writhed on the court in pain, crying, grabbing at her right ankle, slapping the hardwood, her coaches and trainers crowded around. The University at Buffalo women’s basketball team trailed the perennial powerhouse University of Connecticut by 15 points early in the fourth quarter of a second round NCAA Tournament game on Sunday night at Gampel Pavilion, and Dillard, the Bulls’ senior star guard, received a roaring ovation from a crowd nearly 6,500 voices strong as she rose to her feet with assistance and hopped off the court. Dillard’s college career wasn’t going to end like this. The Rochester native refused to go to the locker room, instead sitting in the tunnel as the Bulls mounted a comeback. Summer Hemphill followed with a pull-up jumper. Autumn Jones raced to an uncontested layup and UB – playing without its captain and best player – had cut UConn’s lead to single digits with 6:46 to play. Timeout, Huskies. Within moments, Dillard returned to the bench. Then, improbably, she returned to the game, limping up and down the floor, hitting free throws, sinking a driving layup. This is how one of the greatest playing careers in UB history rightfully came to a close: With an incredible, relentless, dramatic display of courage. The scoresheet shows Dillard contributed 29 points, seven rebounds and seven assists as the No. 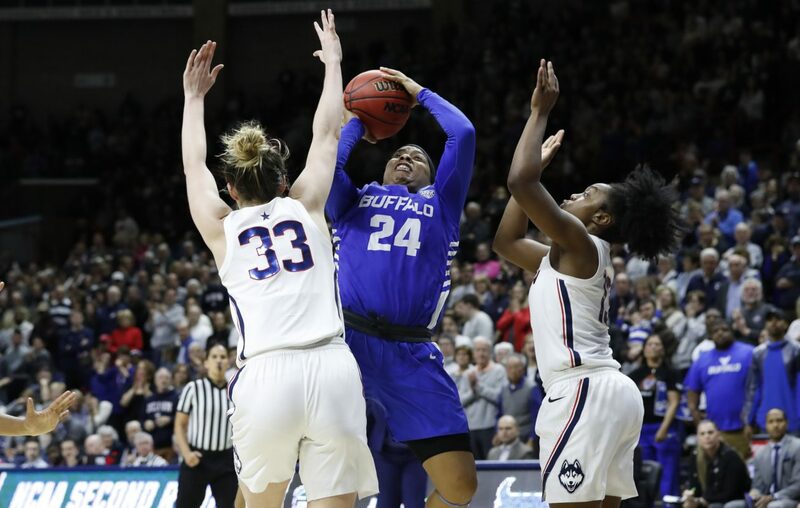 10-seeded Buffalo women’s basketball team’s remarkable postseason run ended with an 84-72 loss to No. 2-seeded UConn (33-2), which stretched its home winning streak to 94 consecutive games. But that doesn’t begin to tell her and her team’s story. Napheesa Collier had 27 points, 16 rebounds, eight assists, three blocks and two steals to pace UConn, which opened the game on a 15-point run and withstood UB’s emotional late-game surge to advance to the Sweet 16. The Huskies have advanced to the Final Four in each of the last 11 seasons, winning six national championships in that span. UB (24-10) was trying to reach the Sweet 16 for the second consecutive season and was making its third NCAA Tournament appearance in four years. 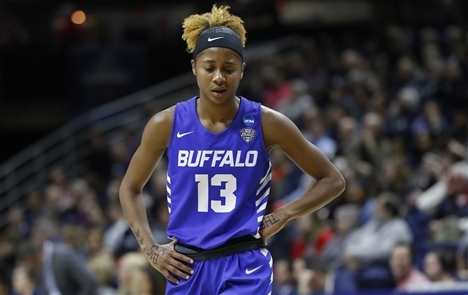 The Bulls secured an automatic bid by winning the Mid-American Conference tournament title, despite entering the field as the fourth seed – accomplishing the goal the 5-foot-9 Dillard set as she returned for her senior season, rather than enter the WNBA draft. “To God be the glory,” UB coach Felisha Legette-Jack said. “What a great, great team I have. What fighters I have. What resiliency I was able to be a part of. This team was out. They punched us and they tried to knock us out. That’s what great teams do. But tough teams don’t let that punch define them. They keep coming back. They keep fighting. And we did some unconventional things. We put people in different positions, and they just kept coming. And this game, we tell them all the time, it’s a microcosm of life. It’s not going to be easy all the time. There’s going to be people better than you. But you still have to find a way to make ends meet for your family. And so you still have to go into that job and be second best. But you’ve got to be the best second best. And I think that we really went out there and did a tremendous job of getting the respect of the nation, in my opinion, of not quitting, of fighting, of believing that they, too, matter. 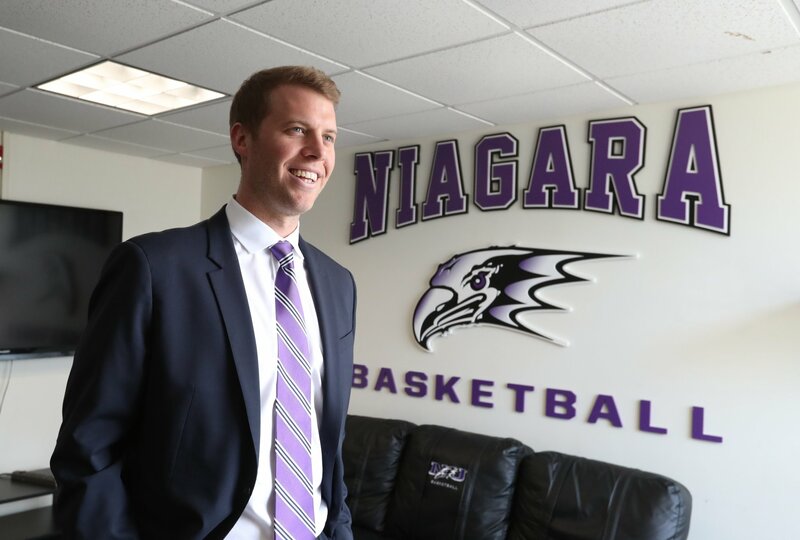 Buffalo graduated five seniors and every starter except Dillard from last year’s team, which rostered nine underclassmen, including seven freshmen. The Bulls upended No. 7-seeded Rutgers, 82-71, in a first-round game Friday, becoming the first women’s program in MAC history to win an NCAA Tournament basketball game in consecutive seasons. But the Bulls seemingly stood little chance against one of the most dominant programs in the history of the sport. UConn built its 15-0 lead while UB floundered, missing its first five shots and committing six turnovers. Hemphill scored the Bulls’ first points on a layup with 5:46 remaining in the first quarter. The Bulls, understandably overmatched, nevertheless continued to battle, playing the Huskies even for the remainder of the first half to take a 15-point deficit, 52-37, into the locker room. UB closed the first quarter on a 9-0 run and ended the first half by hitting six of eight shots while holding UConn without a bucket for 2 minutes, 35 seconds. The Bulls were outrebounding the Huskies, 28-18, at intermission. Legette-Jack remained defiant as UConn’s lead grew to as large as 24 points late in the third quarter, hollering across the floor: "We will not stop playing! We will play through it!" Dillard made a 3-pointer as UB closed to within 73-60 early in the fourth quarter, the closest they had been to UConn since the opening minutes of the game, setting the stage for the dramatic final push. UB nearly finished with five players in double-figure scoring. Jones had 14 points. Brittany Morrison contributed nine points and a team-high 10 rebounds. Hemphill and Theresa Onwuka also each scored nine points. Buffalo won the battle of the boards, outrebounding UConn 48-45. The Bulls’ bench outscored the Huskies’ 25-3. UB had more second-chance points, 28-19, and unleashed an 11-point run to win the fourth quarter, 17-11. But the Bulls shot just 32.9 percent overall and an uncharacteristically low 20.8 percent from 3-point range. They had six shots blocked. Dillard said she thinks she stepped on somebody’s foot and rolled her ankle. “Obviously, the kid’s a tough kid,” UConn coach Geno Auriemma said. “She just makes everybody on her team so much better. She can score, she can find the right player at the right time. She’s got an old-school game to her, you know, really hard to guard, so I’m not surprised when she came back in. Kids like that, their senior year, they’re not going to miss the NCAA Tournament. It’s not going to happen. UConn thrashed No. 15-seeded Towson, 110-61, on Friday, and Buffalo entered Sunday’s game a heavy underdog. Legette-Jack acknowledged the daunting task, but asked her players to allow courage to overcome fear, and the Bulls left the court as they arrived – with their heads held high. “I’m not in a good mood. I can’t stand to lose,” Dillard said. “I don’t care if I’m playing against Michael Jordan in a one-on-one, I’m going to win. So I can’t stand to lose. I know my teammates can’t stand to lose either, and this one hit us hard. I just got myself together for this press conference, being professional. But I definitely think that we fought hard.